Cosmetic surgery is focused on maintaining, restoring, or enhancing normal appearance through medical and surgical techniques. Cosmetic surgery is an especially popular field for medical tourists since U.S. insurance plans do not generally cover elective surgery. You will be able to save thousands of dollars by receiving most cosmetic surgeries abroad, and you can expect results equal to or better than what you could expect in the United States. The plastic surgeons in MedTrava's network are well qualified in their field and have performed many successful cosmetic surgeries on medical tourists. Read below for more information on some of the cosmetic surgeries the doctors in MedTrava's network can offer you. This information on cosmetic surgery overseas is provided to you by MedTrava, medical tourism experts. Breast Implants - Enlargement or augmentation using saline filled prosthesis. Breast Lift - Commonly performed in conjunction with augmentation using implants. Breast Reduction - Done to reduce, recontour and reshape breasts. Calf Lift - Used to restore symmetry to the legs. Gynecomastia - Breast reduction for men. Liposuction - A very common procedure designed to permanently remove fatty tissue. Thigh Lift - Removing excess skin and fat. Upper Arm Lift (Brachioplasty) - Removes excess, loose skin. Liposuction can remove excess fat as long as skin is still tight, but if the skin is not tight, an upper arm lift is the only solution. Cheek/Facial Implants (Malar Augmentation) - Skeletal augmentation of the face providing a more healthy and youthful appearance. Chin Implants (Genioplasty) - Implanting a small synthetic implant over the natural bone to create a chin more suitable for the face. Eyelid Surgery (Blepharoplasty) - Corrects sagging or drooping eyelids and/or bags and bulges around the eyes, by removing excess skin and fat if necessary. Ear Shaping (Otoplasty) - Surgery done to correct deformed or protruding ears. Facelift (Rhytidectomy) - Involves tightening of the facial and neck muscles and removing any excess skin, leaving a more youthful appearance. Forehead Lift / Endoscopic Brow Lift - Designed to raise eyebrows and upper eyelids as well as softening deep frown lines between the eyebrows. Lip Implant – For those seeking a more permanent way of achieving full lips, lip implants are the answer. A procedure that can usually be done in five minutes per lip, using local anesthesia. Nose surgery (Rhinoplasty) - Surgical procedure used to sculpt the nose, improving the shape and size. Laser Resurfacing - A specialized beam of light energy is used to minimize wrinkles and lines on the face. Thermage - A revolutionary non-surgical technique using radio frequency which produces heating of the deep dermis. Thermage can be used to tighten loose skin and wrinkles and may also improve complexion and acne. Chemical Peel - Treatment that exfoliate the skin’s top layers to reveal a softer and healthier skin. It is used to treat people prone to acne, damaged/hyper pigmented skin, due to environmental exposure. The strength of the treatment will depend on the individual’s skin type and the degree of skin damage. Dermabrasion - Is a treatment where the skin’s surface is abraded or sanded using special diamond rotary instruments. The surgeon works to reduce the skin’s surface depth and after healing takes place, the skin is smoother and has fewer irregularities. Sclerotherapy - The treatment for spider and varicose veins where a chemical (usually saline) solution is injected into the blood vessel causing it to collapse. 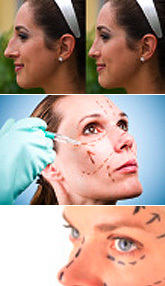 This information on overseas plastic surgery is provided to you by MedTrava, medical tourism experts. Treatment takes 2-3 hours and is performed in an under general anesthesia. The incision is usually made at the bikini line so that any scarring can be hidden beneath the underwear. The skin is then separated from the abdominal wall and lifted up, exposing the loose tissue that covers the abdominal muscles. The excess skin and fat are then removed and the remaining skin pulled down over the tummy. Bandages are then applied to the area. In some cases, it is recommended that the tummy tuck be combined with liposuction in order to eliminate localized fat accumulation. The hospitalization period, depending on the extent of the surgery, is for 3-4 nights at the cosmetic surgery clinic. Upper Arm Lift (Brachioplasty) - Removes excess, loose skin. Liposuction can remove excess fat as long as skin is still tight, but if the skin is not tight, an upper arm lift is the only solution. In this cosmetic surgery procedure, an incision is made along the inner arm from the elbow to the armpit and the surgeon removes the excess skin and fat. The procedure will last from two to four hours. You should be able to return to daily activities within two weeks. It will take six weeks for the swelling in your arms from your upper arm lift to go down and you will have to wear supportive Ace wraps until the swelling subsides. The incisions can take up to a year to fully heal. Facelift (Rhytidectomy) (section from above will link here) - Involves tightening of the facial and neck muscles and removing any excess skin, leaving a more youthful appearance. The best candidate for a facelift surgery is someone whose face and neck have begun to sag, but whose skin still has some elasticity and whose bone structure is strong. Most patients are in their forties to sixties, but facelifts can be done successfully on people in their seventies or eighties as well. Facelift operations last several hours and are performed with a combination of general and local anesthesia. Incisions are made behind the hairline and behind the ears to hide scarring. The speed of healing depends on the individual, but you will be able to remove your bandages after 3–4 days. The swelling and bruising should go down within 14 days. Nose surgery (Rhinoplasty)(section from above will link here) - Surgical procedure used to sculpt the nose, improving the shape and size. The best candidates for rhinoplasty are people who are looking for improvement, not perfection, in the way they look. If you're physically healthy, psychologically stable, and realistic in your expectations, you may be a good candidate. Rhinoplasty is the surgical treatment to modify the size and shape of the nose. By re-modelling the bones and cartilage of the nose, we can achieve a subtle new shape that harmonises perfectly with the rest of the face. At consultation, the plastic surgeon takes into account the overall look of the nose from all angles, especially the relationship between nose, forehead and chin. This operation encompasses surgery on both the soft and hard (bone) parts of your nose. It is performed under general anaesthetic and takes approximately 2 hours. After nose surgery, you should be able to return to your daily activities within 8-10 days. You will need to wear a splint on your nose for 10-14 days, and for a further 14 nights. For affordable Cosmetic surgery overseas, Register with MedTrava now or call 1.877.My.MedTrava. MedTrava is dedicated to connecting patients to world-class healthcare abroad at affordable prices. Click here to read testimonials of some of our patients who have received medical treatment abroad. The above indicative prices are in USD.